It’s amazing how much more room you can find when you take advantage of vertical space. 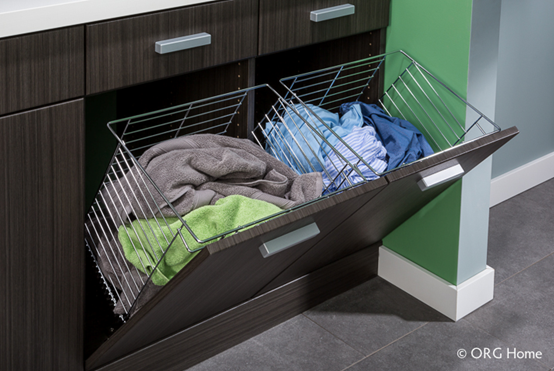 Adding a Hoosier Closets’ custom organization system with cabinets, shelves, hampers, and baskets can dramatically increase your storage capacity, letting you store supplies within arm’s reach while keeping them tidy behind closed doors. Instead of a bulky, full-size ironing board, try a space-saving fold-out board that’s easy to stow off the floor and out of sight when not in use. And it’s not just for the laundry room. 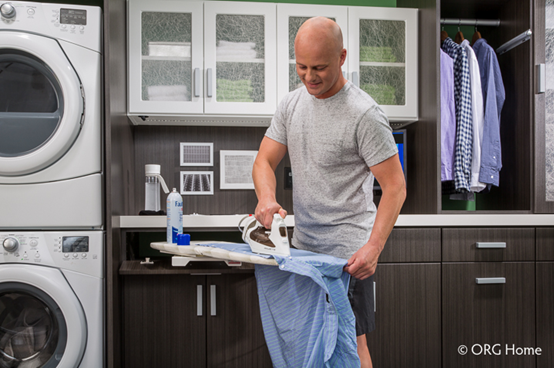 This compact board offers convenient ironing in your bedroom when you add it to a Hoosier Closets’ closet organizer. You can also use a hook to hang your full-sized board flush against a wall when it’s folded. Once clothes come out of the wash, built-in hanging rods make it simple to air-dry delicates. Consider adding a slide-out valet rod to hold freshly dried or ironed clothes on their way back to your closet.